"HARMONY-2008" of The International Association of Lions Clubs comprising of Lions Clubs of Chandigarh, Mohali, Kharar & Ropar was organized on Sunday the 23rd of March, 2008 at Rajasthan Bhawan, Sector 33, Chandigarh where about 300 delegates from all over Punjab participated. 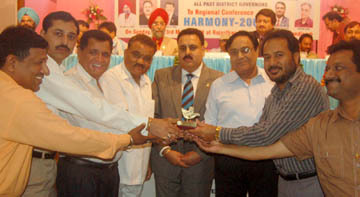 Region Chairperson MJF Lion Amarjot Singh awarded the clubs for holding various service projects during the year. Chief Guest of the evening District Governor MJF Lion H.J.S.Khera lauded the efforts put in by Region Chairperson MJF Lion Amarjot Singh in maintaining perfect harmony between various Lions Clubs of the area and also applauded Club leaders for the commendable work done by holding Eye Operation Camps, Blood Donation Camps, Mega Medical Camps and for organizing various Seminars on burning relevant topics such as Female Foeticide, Global Warming, Anti Dowry, Eye Donation, Drug De-addiction etc. Lions Club Chandigarh Greater, Lions Club Chandigarh Supreme & Lions Club Kharar Umang were declared Best Clubs of the Region in their respective categories and MJF Lion Shanti Lal Sethia, MJF Lion Kewal Bansal & Lion Pritam Singh were declared Best President, Secretary & Treasurer of the Region.